PERTH…hear me now! !...” Everything is just great” …ALL FRUITS RIPE!!! !.......All is good!!! ALL FRUITS RIPE - Perth’s newest Reggae Jamm - taking place outdoors, in the beautiful surrounds of the Fremantle Arts Centre. The ingredients are here for what will be a special spring evening filled with great music, good times and a vibe to match…in the words of the great Bob Marley…”Wake Up and Live” and its time to do just that!!! THE ORIGINAL WAILERS! – Bob Marley’s band!! – Arguably the greatest reggae band of all time, keeping alive the memory of the most loved artist in Reggae history. BLUE KING BROWN! – One of Australia’s premier Roots acts, their power packed live show is renowned worldwide. TOMORROW PEOPLE! – rising stars of New Zealand’s booming reggae scene, having recently hit number 1 on the Aotearoa reggae charts they will play in Perth for the first time. This is one evening of positive vibrations that can’t be missed! Tickets $64 +bf available through Oztix.com.au & Oztix Outlets. 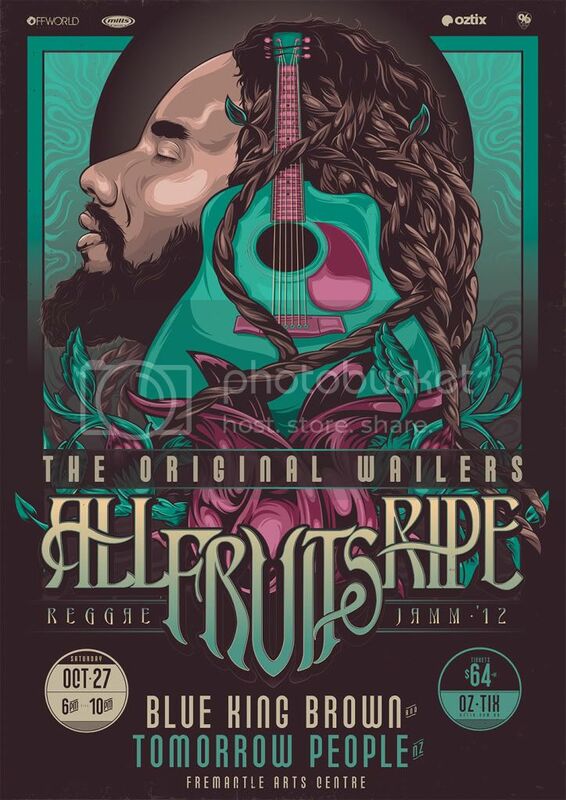 "It is with great sadness that Offworld Productions has to announce the official cancellation of All Fruits Ripe Reggae Jamm 2012.
l Wailers national tour the effects on the event were significant - including a change of venue and artist bill reshuffle. With these adjustments in place Offworld Productions feels that the ethos of the event has been jeopardized and it is with sincere regret that the decision has been made to cancel the event due to be held on Saturday, 27th October 2012. We have plans for the return of All Fruits Ripe in the future. Tickets purchased online through Heatseeker/Oztix will automatically be refunded to the credit card used for purchase. Tickets purchased from an outlet/store will need to return to the point of purchase for a refund. Our sincerest apologies for any inconvenience."